A presentation workshop held in December 2013 with a presentation by CSC and a feedback from the EC. The European Commission adopted in September 2012 the Communication "Unleashing the potential of cloud computing in Europe" to stimulate the uptake of cloud computing to the benefit of European customers and providers. One of the three Key Actions proposed in the Communication focuses on standardisation. 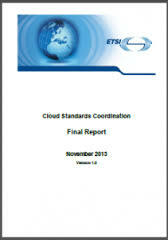 Promote trusted and reliable cloud offerings by tasking ETSI to coordinate with stakeholders in a transparent and open way to identify by 2013 a detailed map of the necessary standards (inter alia for security, interoperability, data portability and reversibility). Enhance trust in cloud computing services by recognizing at EU-level technical specifications in the field of information and communication technologies for the protection of personal information in accordance with the new Regulation on European Standardisation.